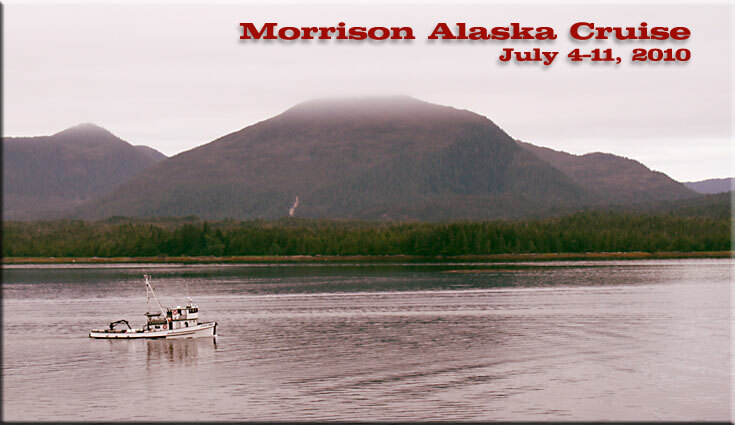 The Morrison Alaska Cruise departed Seattle on July 4th, 2010, with destinations of Ketchikan, the Tracy Arm glaciers, Juneau, Skagway, Victoria and back to Seattle. The contingent ended up being six couples, not a large group, but what turned out to be the right size for really getting to know one another. We were able to have dinner at one large table in the dining room, and the rest of the time we mingled as the opportunity presented itself. 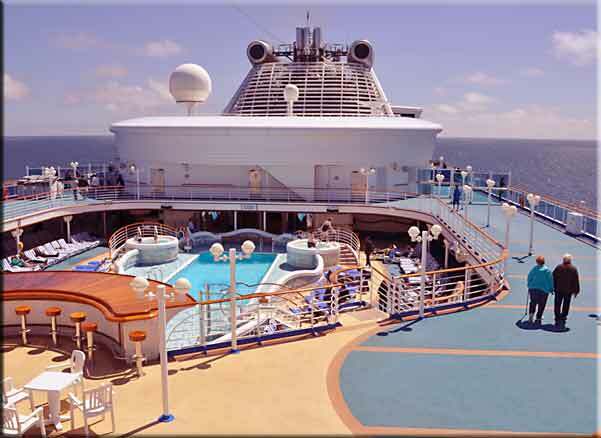 We gathered on the pool deck after checking on board and started to get our bearings of the very large Sapphire Princess. 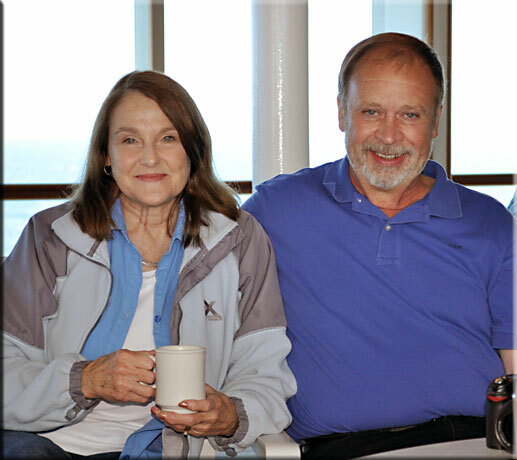 Finding one another is difficult on a ship 1,000 feet long and 14 stories tall, so we set up rendezvous times and places when we could get together for meals and activities. We all showed up ready for a vacation, and the first couple of days were spent in serious unwinding. The ship offered plenty of options for doing this, with others or alone. There were plenty of places to stretch out on a deck chair, or to read a book, and comfortable places for getting together for a conversation. One of our hangouts was the pool deck, close to the coffee. Joyce Peterson, Joyce Lynn Maslin, Don Webster. We had dinner each evening in the International Dining Room, one of four formal dining rooms. 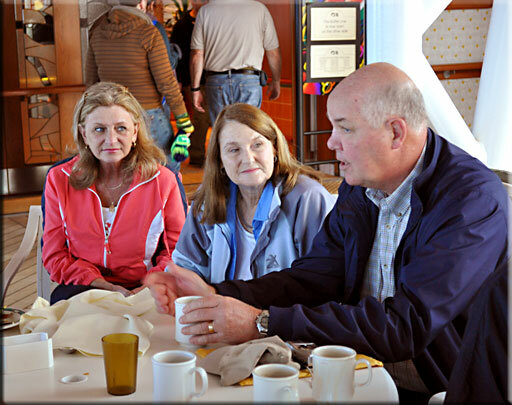 We usually took other meals at the buffet on the Lido (pool) deck. Joyce Lynn and Phil Maslin, Doug and Jojo Nelson. Jim and Joyce Peterson selecting from the menu. 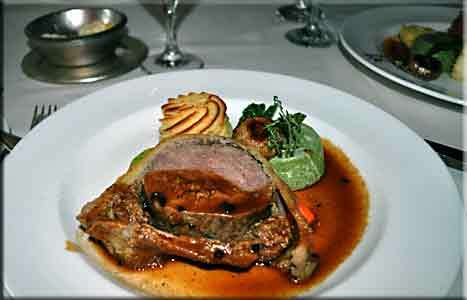 Each night one could choose from a half dozen appetizers, several soups, about 8 entrees and a half dozen deserts. Portions were not enormous and there were always plenty of healthy choices for those so interested. Pat Webster said she actually lost weight on the cruise because she walked so much. Our waiter, Arthur, was very well informed and always gave us hints as to what looked best on the menu. 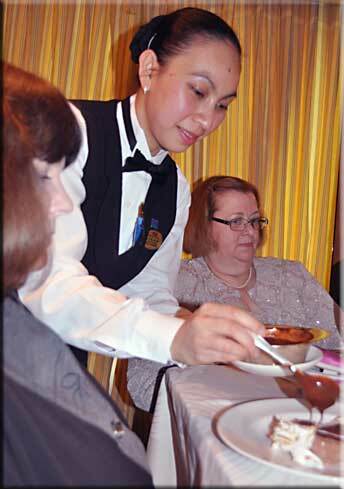 Assistant Waiter Jeanne, serving Debbie Johnson the Baked Alaska. Pat Webster in the background. 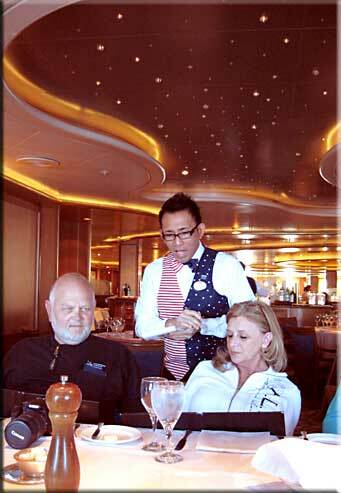 The wait staff on the Princess were predominantly from the Philippines, with some from other parts of Southeast Asia. They were well trained and had a strict career path which was based on bidding for contracts, approximately eight months of service on a given ship. Promotions were based on merit, as openings developed. If no opening was available at their pay level, it was possible to have to accept a contract at a lower pay level for the next period of service. The staff were always surprised when us Third Culture Kids were quite curious as to the details of where they were from, and even more surprised to find that many of us had grown up in Asia. That usually broke the conversation wide open. There was a themed music show or variety show after dinner most nights. The band on this ship was particularly good. After the show we typically found a quiet lounge in which to share stories into the night. On the 14th deck, looking down at one of six pools. 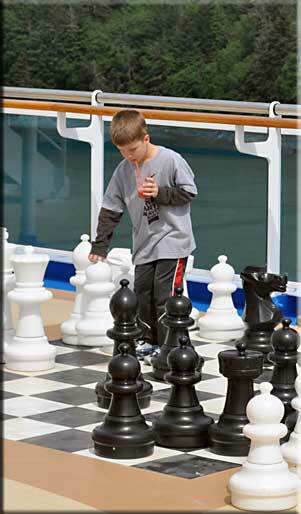 Chess on the kid's level. I asked a number of kids during the cruise what was the best part. Invariably, they said, "the kids club". Parents also appreciated that their kids were so well entertained and supervised. A foyer inside the ship.